Wenatchee North Rotarian-at-Large and owner of Ridge Cyclesport Evan Plews. Our newest youngest Rotarian, Henrik Bentsen. And a new proposed member named Shannon! Francis Scott Key pens the poem that eventually becomes the Star Spangled Banner. For the whole rundown, check it out here via History Channel. David Kazemba had a buck in celebration of being elected to the debtor/creditor section of the Washington state bar association. Martin had a buck for the fact that they got to see good friends recently. Mike Williams had a buck for the weather that's been helping knock down wildfires in the region, and in praise of the rain in the forecast. Even Plews gave a buck in thanks for his new employee at Ridge Cyclesport, which allowed him to attend the meeting. David Bentsen had a buck for the baby, and the fact that he recently got his irrigation system in order. Dom gave a buck in celebration of his daughter Natalie's first birthday, which the Bonny clan celebrated recently. And Richard had a buck for a wonderful memory made while fishing with his grandkids. Stay tuned for details on volunteer opportunities with WVC Athletics. Rob or Rachel will be contacting all with further details. Rotary district officer meeting in coming up in Osoyoos, B.C. All Rotary officers are encouraged to attend. Talk to president Richard for more details. The Rotary leadership institute is coming up soon and will take place over three Saturdays here in Wenatchee. It's not always so close so it's a great opportunity for us to take advantage. Talk to president Richard for more info. Do you know a student who is interested in a Rotary exchange? Tell them about the upcoming informational night at Wenatchee High School Sept. 27! The Dark Side Ride is coming up Sept. 30, and it's the kickoff fundraiser for the new local non-profit called TREAD. Learn more here. Also Make A Difference Day is coming up Oct. 28 and Randy is heading up our WNR group project. Talk to him for more info. 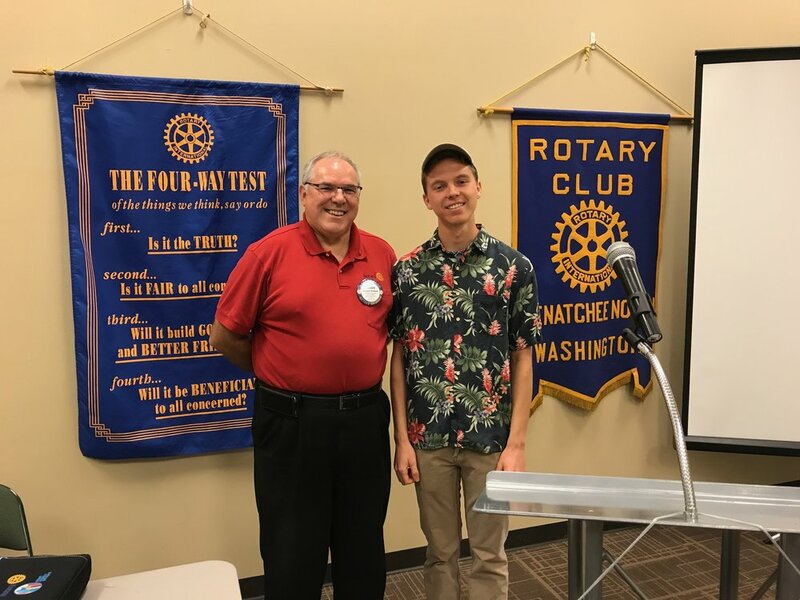 For our presentation we welcomed Marcus Wagner with the Wenatchee Mini Makers Faire, and watched an informational video about this annual event geared towards celebrating and showcasing local STEM students' achievements. These are some pretty amazing students, as you can see by watching the video from NCWLife above. The 2017 Mini Maker Faire is coming up soon and they could use some more adult volunteers. If you'd like to pitch in with simple stuff like parking or crowd counting duty, please email Ron Brown at rbo@me.com. Thanks Marcus and great job!